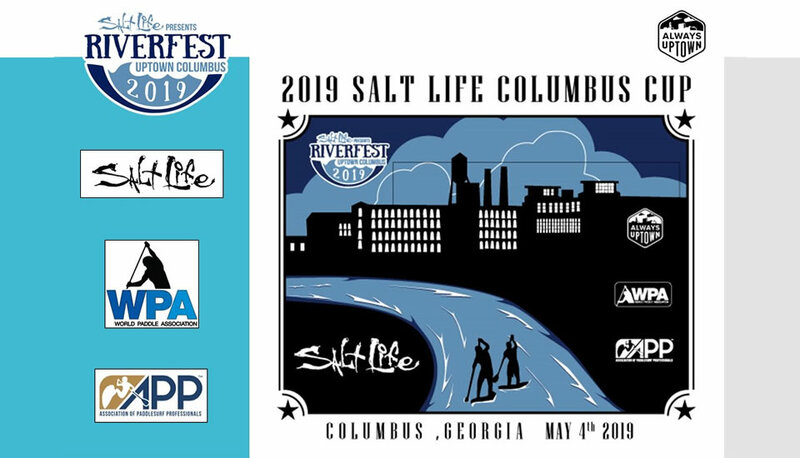 COLUMBUS, GA. (March 18, 2019) — Salt Life, one of today’s leading lifestyle apparel brands, in conjunction with the World Paddle Association (WPA) and Uptown Columbus RiverFest, proudly announces the 2019 Salt Life Columbus Cup on May 3 & 4, 2019, in Columbus, Georgia. The event will take place on the Chattahoochee River (90 miles south of Atlanta) three blocks from downtown Columbus. The paddle race will be part of the Columbus RiverFest, also presented by Salt Life, which brings together the local community to celebrate water activities and safety with two days of food, drink vendors and live entertainment at the Woodruff Park event site. Visit www.uptowncolumbusga.com for more details. The 2019 Salt Life Columbus Cup’s Pro-Elite race will be sanctioned by the APP (Association of PaddleSurf Professionals) and points will count toward the 2019 APP World Tour. In addition, the Pro-Elite race will be conducted on inflatable stand-up paddle boards with the competitors navigating whitewater sections and finishing with a technical buoy course. The Pro-Elite race offers a total cash and prize purse of $32,000.The Pro-Elite competitors will also earn points toward qualifying for APP World Tour events that are only open to the top 32 men and women entries. Competitors will also be able to earn points through the WPA-Salt Life U.S. Championship Series which is an APP World Qualifying Series. Open and Juniors participants will again compete in a 3-mile course race at Woodruff Park and have the chance to be crowned “Open & Junior Paddler of the Year” at the season ending Pacific Paddle Games on October 12-13, 2019. “We are extremely proud to be working with the APP World Tour where we host the APP World Tour event and the APP World Qualifying Series through the WPA-Salt Life U.S. Championship Series,” stated Byron Kurt, President of the World Paddle Association (WPA). Kurt continued, “Both the WPA’s and APP’s goal is to continue to provide the best events at the best venues while offering competitors two great series to participate with the most experienced SUP organizations in world.” The APP will offer top caliber races throughout the world and crown the 2019 APP World Champions, while the WPA manages the U.S. Championship Series and APP World Qualifying Series.. Along with the Salt Life RiverFest activities on Friday and Saturday, SUP yoga clinics and classes will be offered along with Pro-Elite paddle clinics including 4x time World SUP Champion and 2018 Salt Life Columbus Cup Champion Connor Baxter on Friday, May 3, 2019. For more event details, including race schedule, hotel discounts, transportation and other information regarding the Salt Life Columbus Cup, WPA-Salt Life Cup Series and the WPA-APP World Qualifying Series, go to: www.worldpaddleassociation.com, www.appworldtour.com, www.paddleguru.com, www.uptowncolumbusga.com and www.saltlife.com. From its first merchandise offerings in 2006, Salt Life has grown with distribution in surf shops, specialty stores, department stores and sporting goods retailers. Salt Life products are also available to consumers at www.saltlife.com and at Salt Life’s various branded retail stores, including locations in Huntington Beach and San Clemente, California, Columbus, Georgia, and Daytona Beach and Tampa, Florida. The brand’s flagship store is located in Jacksonville Beach, Florida, where the term “Salt Life” was coined over 15 years ago. The Salt Life brand is committed to supporting conservation efforts by contributing to various organizations through Salt Life Gives Back. Learn more here. Salt Life, LLC is an operating subsidiary of Delta Apparel, Inc. (NYSE American: DLA). Salt Life’s corporate office is located in Columbus, Georgia and its distribution center is located to Fayetteville, North Carolina. Uptown Columbus, Inc. is a 501(c)(3) non-profit organization that facilitates and coordinates economic revitalization throughout the Uptown area. Uptown Columbus is dedicated primarily to the revitalization of all areas of Uptown Columbus into a model city where people desire to work, live, shop, dine and explore educational opportunities.